Growing up in Murrieta, California it was only natural that Mitchell Falk would find his was into motocross. After all, his dad still races almost every week at REM Glen Helen and his two brothers were both local Pros. 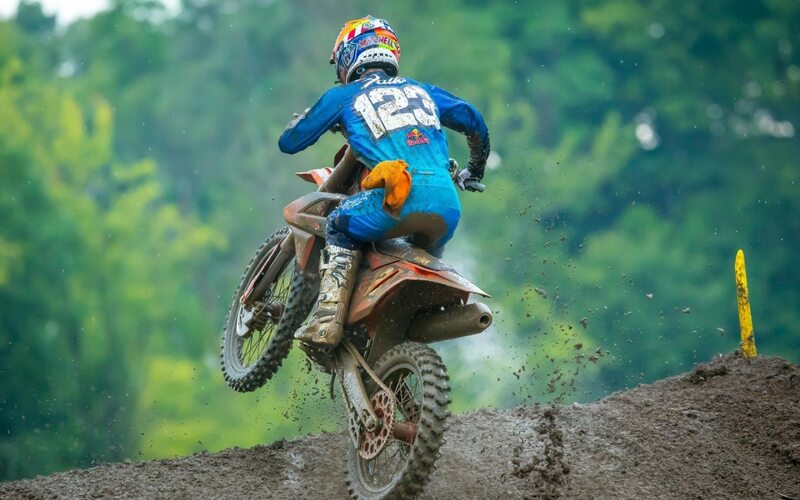 Mitchell turned Pro late in the 2018 AMA 250 National series motocross series. 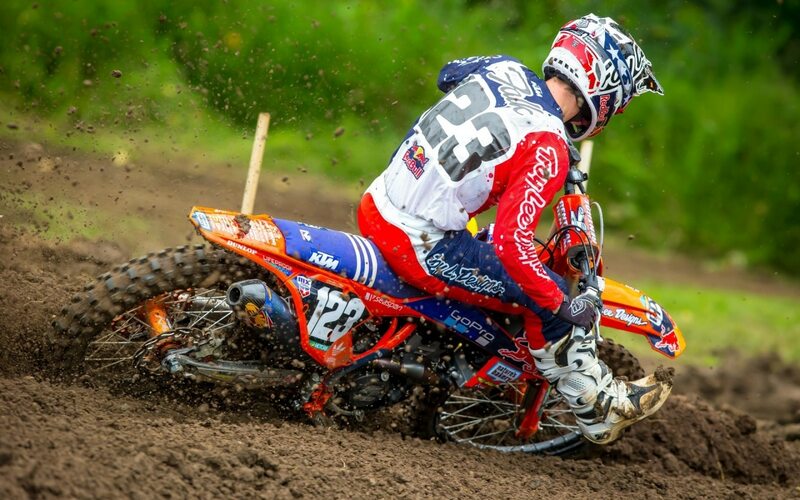 Unlike his peers however, Falk made his debut at the pentimulate round at Budds Creek, Maryland due to injury. While Mitchell didn’t have a 12-race series to truly make a rookie impact, his up front start at Budds Cree put him on the map—until crashing going down Henry Hill. Mitchell has a full-time deal on the Troy Lee team for 2019—so youll be seeing a lot of him. BUDDS CREEK WAS YOUR FIRST PRO RACE. WHAT WS IT LIKE TO BE RUNNING UP FRONT? That was the whole goal. Just no expectations, get a good start, try to run the pace, and learn as much as I could. The first moto I started around second, but got bumped, and my clutch lever was basically unusable. That was really tough to begin the moto with, and I got shoved down to 5th. Then I just passed my way into 4th and I got around Mitchell Harrison. Immediately after that, I made a mistake, and went down. I got up around 10th or so and stayed there for a while. Then I got a little tired and went backwards. In the second moto, I had another good start, and ran in the top ten for 20 minutes or so before tipping over. Then I went backwards and got 18th. If I did not tip-over, I think I would have run 12th or 13th which would have been a pretty good result. I think with the pro guys in the 250 class, the depth of riders is crazy. You can be in 18th and you have guys that are on factory bikes battling with you, and that is what I learned. YOU HAD THE PACE AT BUDDS CREEK ON A HOT AND HUMID DAY. IT MUST HAVE BEEN TOUGH? Yes, that was really tough. In the first moto I was feeling really good. But then after my big crash, where I actually got off easy, it took the wind out of my sails. Then in the second moto I was pretty tired. But I ran inside the top 10 for as long as I could, and then started going backwards. I did not finish the motos as well as I wanted to, but at least in the beginning, I showed promise, and I think I will just keep getting better. Mitchell Falk at Monster Cup in 2016. WHAT WAS THE BIGGEST DIFFERENCE FROM RACING AT THE TOP AMATEUR LEVEL, AND THE PRO SERIES? I think with the Pro guys in the 250 class that the depth of riders is crazy. You can be in 18th and you have guys that are on factory bikes battling with you. That is what I learned. I knew it was going to be tough. There are 20 really, really good riders, so I think that is the biggest difference is just the depth of the field. MANY PEOPLE BELIVE THAT THE 250 IS MORE DIFFICULT THAN THE 450 CLASS. Yes, for sure. You have a couple of rookies that are doing really well, and then you have all the guys that are used to winning who are 23 years old and up — even up to 28 years old. They are 10 years older than me. So, you really have to have some skill to battle it out with them, but at the same time, you have to just learn as you go. My whole goal is to better myself and better my position and not really expect the whole world, like I am going to go out there and get a podium, you know? I would like to do better than the last race, but you have to be realistic at the same time. DO YOU GAUGE YOURSELF AT AGAINST THE OTHER ROOKIES — LIKE JORDAN BAILEY, ENZO LOPES AND GARRETT MARCHBANKS? Yes, for sure; I definitely gauge myself. I raced Marchbanks a couple of weeks before he made his Pro debut. I think he made a smart decision by going to Hangtown and having a full year of experience. I wished I was a little bit more ready so I could have jumped into Hangtown, which was a track I knew; as well as Glen Helen. I think it would have been a little easier to get in the mix of things on a track that I had ridden before, but it was nice to be able to do media day at Ironman and get the track down since I had never been here before. 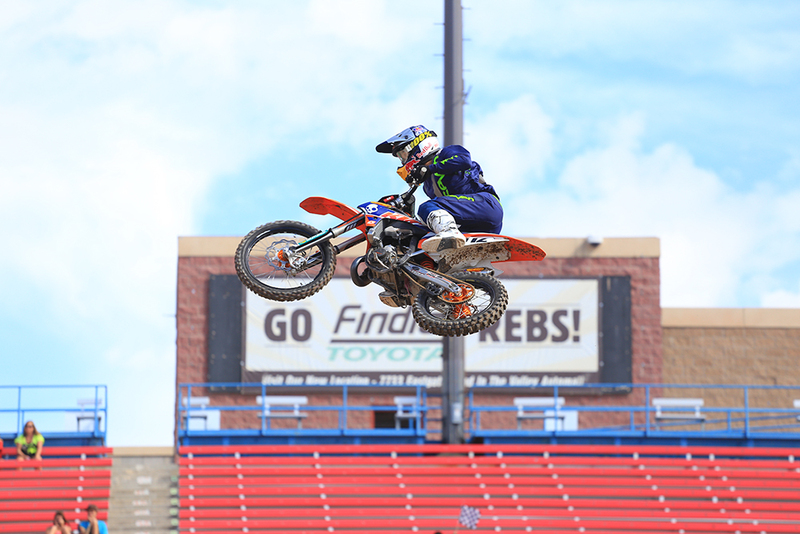 Mitchell on a KTM 85 in 2014 at Monster Cup. HOW MANY AMA NATIONAL TRACKS HAVE YOU SEEN BEFORE? Three. I have gone to Glen Helen, Hangtown and Muddy Creek once, so it is definitely a learning process, but I’ve got to get used to it. I try to get the track down during first practice and then it is game on from there. ARE YOU GOING TO MOVE TO FLORIDA TO TRAIN WITH THE OTHER KTM GUYS? I have grown up in California, but I have been going to Florida a little bit more to work with Tyla Rattray. Throughout this next year, I will definitely be in Florida more to get used to the East Coast weather. California gets hot, but it is a different kind of heat. At the Nationals there are so many different variables. HOW WAS IT WORKING WITH TYLA RATTRAY? it is really cool; I think it is kind of the same system as what Aldon does. Tyla has the mentor of Aldon telling him what to do, keeping the programs pretty similar, and riding with each other during the week. It is definitely a good thing for us to try to get better with each other. Falk during the muddy Ironman National. YOU SEEM LIKE YOU WERE REALLY ANXIOUS TO TURN PRO, BUT HAD TO WAIT? I would have moved up a little bit sooner if it was not for the injuries. But you can’t really change the past no, so I am looking for the present, and the future, and just to get better. TLD HAS A REALLY GOOD AMATEUR PROGRAM AD SEEM TO FIND SOME GEMS—MORE SO THAN SOME OTHER TEAMS. I think that is true. They have a great amateur program through the KTM ranks, and from there they can hand pick their KTM riders. They groom them from 65’s and when they are ready to go to TLD team, there is usually a spot every year for the main rider coming through. HOW WELL DO YOU KNOW THE RIDERS ON THE TROY LEE TEAM? I know the guys pretty well, especially from going to Florida; that helped. I had seen Alex Martin and Shane McElrath racing, and I know Jordan (Smith) a little bit from growing up, racing somewhat close to him. I guess I am pretty close to the whole team. YOU DIDN’T GET MUCH OF A CHANCE TO FIND OUT IN 2018, BUT WHERE DO YOU THINKYOU SHOULD BE FINISHING? To be realistic, I think fighting for a top 10 is what I want to do; even if it is a 10th through a 13th range. I think I should be around there. I started so late this year with only have two rounds to go. I have to wait until Supercross, but I just want to improve every race. 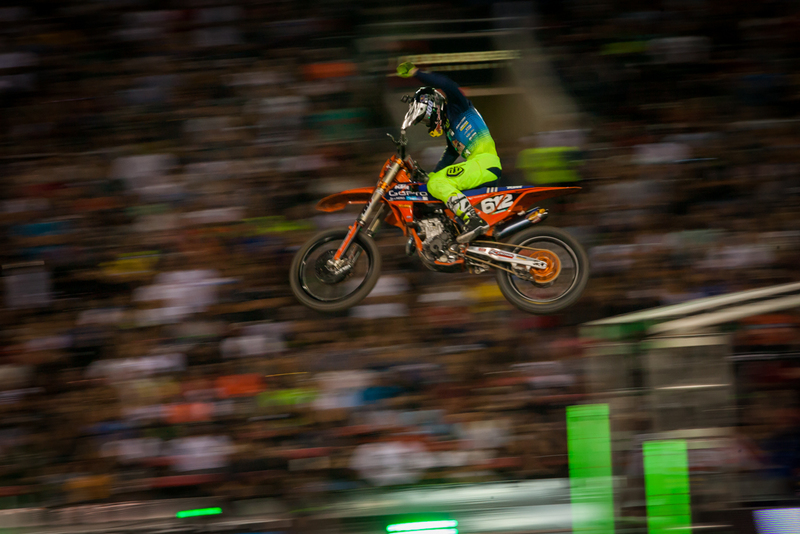 SUPERCROSS IS NEXT ON THE PROGRAM, APART FROM THE AMATEUR EVENTS AT THE MONSTER CUP, YOU DON’T HAVE MUCH EXPERIENCE. WHAT’S THE PLAN? I think I gel pretty well with Supercross. I probably need to do a little bit of fine tuning during the off season. I just need to get a few things figured out.